It’s that time of the year when the big name artists start rolling out their greatest hits packages. 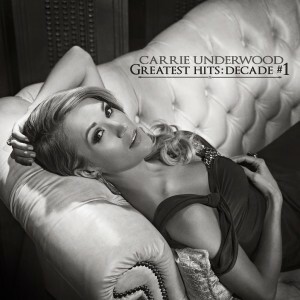 Former ‘American Idol’ and country music star Carrie Underwood is the latest to put her hand up in the best-of bunch for 2014, announcing the December release of ‘Greatest Hits : Decade #1’. “I can’t believe it’s been a decade since I auditioned for American Idol. Looking back at the songs I’ve released over the years lets me relive my amazing journey. Even better I get to include new music for the fans!” she said in a statement. The package will comprise a selection of her 18 country No.1 singles thus far, along with new single ‘Something In The Water’, which is available at digital retailers today. A full tracklist, however, is still forthcoming. ‘Greatest Hits : Decade #1’ will be released in Australia on Friday December 05.